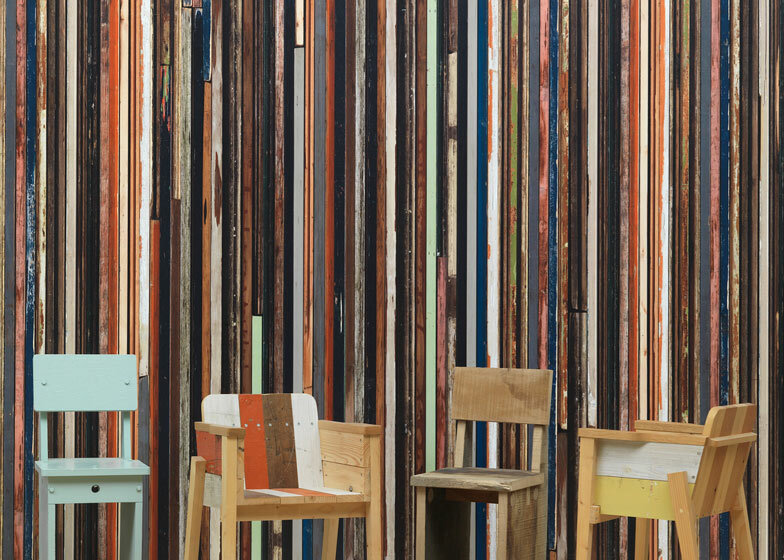 Product news: Dutch designer Piet Hein Eek has produced a wallpaper collection that replicates weathered wood textures. Piet Hein Eek's second collaboration with Dutch wallpaper company NLXL comprises eight designs. His original Scrapwood collection was launched with the brand in 2010. This new range expands on the previous designs based on "waste furniture" to include patterns of realistic wood cross sections, beams and planks. The wall coverings have a matte finish to make them look more convincing. "We chose a new, super luxurious matte finish so the wallpaper looks even more realistic than before," said the designer. First shown at trade show ICFF in New York earlier this year, the collection will be on display during Dutch Design Week 2013 in Eindhoven, the Netherlands, later this month. We've also featured wallpaper that reveals images of leafy forests and palatial interiors under different coloured lights, plus a jagged wall decorated with patterned graphics.